The YSS family is improving their children’s health and also assisting their neighbors to do the same. 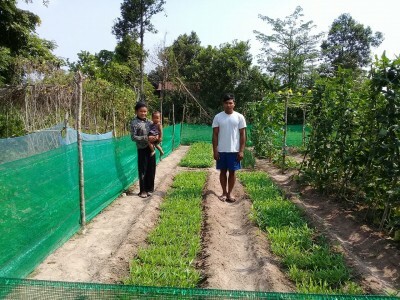 They are sharing organic techniques for growing nutritious vegetables for their children to eat. Mr. YSS is a resident of Peaksneng Village who has been working in agricultural since he was young, because his parents and grandparents were farmers. 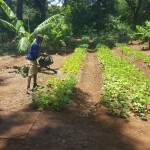 After his grade 6 graduation, he started farming a half hectare of land in the same way his family had been doing. 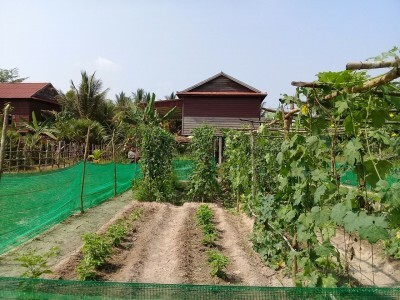 He grew rice, corn and a variety of vegetables. He tried to farm his land productively but in the end he received very little income after repaying the seeds, fertilizer and pesticide loan, which he had borrowed from the supplier. He started noticing the higher productivity of some of his neighbors’ gardens that were being cultivated organically. He became interested in trying organic growing techniques, because his primary concern was the health of his family. 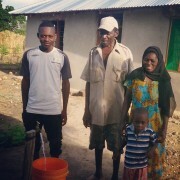 He thought that it might be a way to make sure his family had enough vegetables to eat, and to possibly earn extra income from selling surplus vegetables. 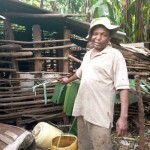 The local garden shop helped him with training and building a garden, and now his hard work is paying off. His work has benefited both his own and neighboring families, because he has been sharing what he has learned from the on-going organic growing mentoring provided by the shop team. On a normal day, Mr. and Mrs. YSS wake up at 5 am. for cooking, vegetable gardening, and feeding the pigs and chickens. 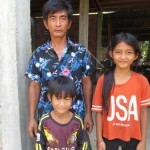 During rice season Mr. YSS also works in his small rice field: ploughing, transplanting, harvesting and threshing. 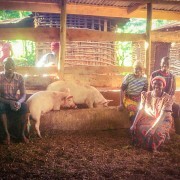 The family dreams of raising more farm animals like pigs and cows, so that they can increase their income and be able to send their children to school. They would also like to make life a little easier one day by buying a motorbike for transportation.